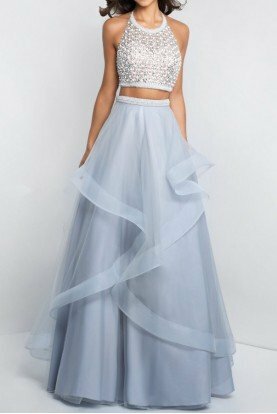 This Marina long prom dress is flattering and elegant! Swirling patterns of shimmering sequins embellish this formal gown. The lovely v-neck and empire waist on this special occasion dress are figure-flattering and sophisticated. This sequined long formal dress falls to the floor with a slight flare at the hem. We only have the dark gold version of this dress in stock. The white is to show what the back looks like. According to the designer's size chart, this dress fits 35/28/38.